Frank Morin was born on February 28, 1925 to Cree parents from a Reserve at Hobbema in central Alberta. While still a baby, a powerful Cree medicine man named him "Sitting Wind" (Ganuða Ĩmãkĩjé in the Ĩyãħé Nakoda language.) Ganuða Ĩmãkĩjé was four when his mother died. His Cree maternal grandmother and Ben Kaquitts, his Ĩyãħé Nakoda step-grandfather, adopted and raised him on the Morley Reserve. He was re-named Frank Kaquitts. Ganuða Ĩmãkĩje learned how to hunt and trap, and also worked for ranches adjacent to the Morley Reserve. During World War II, Ganuða Ĩmãkĩjé enlisted in the Canadian Army. He attended basic training, during which time he became a skilled boxer. A foot injury prevented Ganuða Ĩmãkĩjé from being shipped overseas to fight the German enemy. After his discharge from the Army, he subsequently attended the Banff School of Fine Arts in Banff, Alberta and became a well-known landscape artist. Originally a registered member of the Chiniquay Band, Ganuða Ĩmãkĩjé transferred to the Bearspaw Band in his adult years. In 1957, Bearspaw Band members elected him as Councillor for a two-year term. In 1961, at age 36, he was elected as Chief of the Bearspaw Band. Ganuða Ĩmãkĩjé later transferred his membership back to the Chiniquay Band, and was elected its Chief in 1973. In November 1973, a referendum was held for the Ĩyãħé Nakoda to decide whether to merge the three Bands (Bearspaw, Chiniquay, and Wesley) to form one Band: the Stoney Band. The three separate Ĩyãħé Nakoda groups had been concentrated together on a single Reserve for 96 years, since the signing of Treaty 7 in 1877. The people voted in favour of joining together with a single Chief. A new Tribal election was held, and Ganuða Ĩmãkĩjé was one of the nominees for the single Chief position. 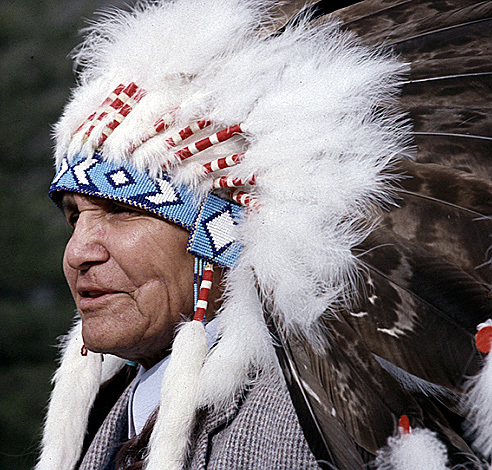 On January 31, 1974, Ganuða Ĩmãkĩjé was elected as the first-ever Chief of the Stoney Band. It was a major hurdle to elect one Chief, but a much bigger one to become one Band. Allegiance to former Band membership remained strong. There was immediate dissent among the people after the election, and also uncertainty whether the merger violated terms of the Treaty, threatening Treaty rights. Although Treaty rights were intact, and the referendum and subsequent election were ruled valid, many members of the Ĩyãħé Nakoda signed a petition to overturn it and revert to the original three Bands and three Chiefs. In late February 1974 while Ganuða Ĩmãkĩjé was away from the Morley Reserve meeting with government officials, the Councillors signed a resolution to comply with the petition. Ganuða Ĩmãkĩjé did not agree with them. He strongly believed that governance by one Chief of a combined single Band would ultimately benefit the people. However, he felt compelled to sign the resolution. Ganuða Ĩmãkĩjé then served the remaining time of his two-year term as Chief of the Chiniquay Band, which had been suspended by the referendum and single-Chief election. He was again elected as Chief in 1984. In 1988, Peter Jonker authored a book about Ganuða Ĩmãkĩjé titled: The Song and the Silence, Sitting Wind, The Life of Stoney Indian Chief Frank Kaquitts. Ganuða Ĩmãkĩjé fully believed his main purpose in life was to be of service to his people, the Ĩyãħé Nakoda. He passed away on November 19, 2002 at age 77.